FIAcompact is an efficient solution for laboratories with small amount of amples. Different parameters can be analysed sequentially. Complex procedures like digestion or enrichment processes can be performed due to two independently controlled multichannel pumps. Within minutes the complete method unit can be changed easily. Our universal method unit combines the basic parameters for analysis of water samples: ammonia, nitrate, nitrite, ortho-phosphate. 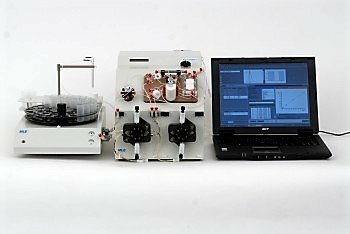 Measurement of summary parameters total nitrogen and total phosphorus content in water samples or extracts can be carried out due to implementation of a digestion unit. The parameters free and total cyanide content can be quickly measured with the cyanide analyzer.